Today is the sixty-fifth anniversary of the atomic bombing of 長崎 (Nagasaki, Japan). Last year I wrote a post (click here) about the peace memorials in Hiroshima and Nagasaki. And three days ago, I wrote a post about the 65th anniversary of the attack on Hiroshima. In Nagasaki today there will be a peace ceremony just as there was in Hiroshima last Friday. I believe the U.S. ambassador to Japan will attend this ceremony just as his attended Hiroshima’s ceremony. 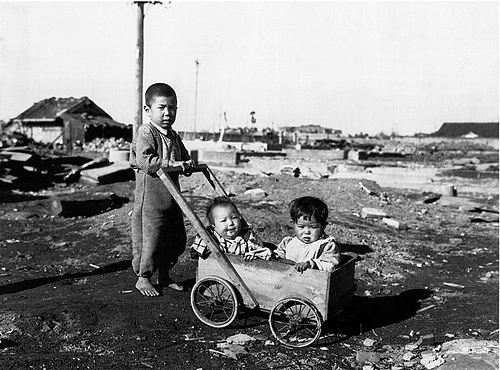 After the atomic bombing of Japan in August 1945, many U.S. military soldiers and marines were stationed in Japan for the U.S. occupation of Japan that lasted until after the Vietnam War. One of those U.S. Marines was Joe O’Donnell. He was a photographer in the U.S. Marines and was stationed in Japan to photograph Hiroshima and Nagasaki after the bombings. What he saw there deeply affected him and convinced him that the atomic bombing of Japan was a mistake. For many years after he returned to America, he tried to forget what he saw in Japan. But finally about twenty years ago he decided to share his photos with the world so that maybe the mistakes of the past won’t be repeated. He showed the photos he took to his son, who then had them published in a book and he also started a MySpace page for his father. He 1995, Joe O’Donnell was interviewed by Japan’s NHK TV station for a documentary about the 50th anniversary of the atomic bombings. (I remember watching that interview on NHK fifteen years ago). In that documentary, Joe O’Donnell apologized to the people of Japan, especially the victims of the bombings and their families. …I want to express to you tonight my sorrow and regret for the pain and suffering caused by the cruel and unnecessary atomic bombings of your cities…No more Hiroshimas! No more Pearl Harbors! No more Nagasakis! As fate would have it, Joe O’Donnell died three years ago today. On 2007 August 9th…the 62nd anniversary of the atomic bombing of Nagasaki! We are responsible for this as a speciece, as a whole. We did this. And hopefully we can stop having wars against each other one day. The picture is not sad guys but shows the boys resolution. The boys courage displays how great the nations courage was . Yes, if the nukes have not been used, america would have suffered a great loss, but that does not give them the right to kill innocent people. The war at the first place was encouraged by americans to strengthen their economy, when the world war 2 ended, americans emerged as the most powerful and wealth country. The reason is the war was not happening in their land ,but all the machinery used in the war were sold or financed by Americans as loan…. They supplied war machinery for both allies and axis in world war one, then they financed britain and soviet with money , old war ships and guns for the same money they lended. I don’t think America had such an agenda. I wish it didn’t have to end this way. The children and those that had no role in this war. But to those that bash the U.S consider these hard facts: We didn’t initiate our presence in this war, Japan was warned before the first drop, they could have surrendered after the first drop. Most important to those casting blame…..If japan had the means do you think they would have done the same. I thought so. God help us. >they could have surrendered after the first drop (on Hiroshima). With the non-stop aerial bombing of Tokyo, communications in Japan was slow. It took more than three days for the Emperor to learn of the magnitude of the destruction to Hiroshima. >If japan had the means do you think they would have done the same. Yes, I agree. Japan probably would have. Personally, I think it’s best that Japan lost the war. This country might very well be like North Korea today otherwise. And it’s best that it was America that was the country that defeated Japan … America did much to help rebuild post-war Japan. But atomic bombs must never be used by any country ever again! It is a sad photo. Unfortunately, war causes countless of these, whether there is a camera there to record it or not, and whether the cuase was an atomic bomd, or a blitz on Coventry. The atomic bombings might be seen as an overreation, though that is probably the result of seeing it through the lens of 60 years later. As George MacDonald Fraser argues in “Quartered Safe Out Here”, the Japanese were a no-surrender enemy (kamikaze etc), and the Allies would have had to have invaded and conquered Japan to end the war by “conventional” means. As many Japanses might have died (spread across the country) as died in those two cities in achieving that, and of course thousands of Allied lives would have been lost too. Was it therefore justified to end the war without risking the Allied lives? Ask someone who had been imprisoned in Changi or on the Moulmein railway, and see what you get. Reflect too that Japan has never apologised for those atrocities. This is NOT a straightforward question to answer. >It is a sad photo. Yes, that’s a sad truth. ,>that is probably the result of seeing it through the lens of 60 years later. As time passes, and the generations that were directly affected by a tragedy pass away, it’s true that people that only know about those incidents from a history book often have a mistaken perspective. But I’ve heard that a few members of the actual crew that dropped the bombs immediately regretted it once they saw the immensity of the explosion. Many historians (including some who are Japanese) have said that Japan was on the verge of surrender. And also that those atomic bombs were initially made to be used against Nazi Germany…but once Germany surrendered before the bombs were ready, America changed the target to Japan. >Allies would have had to invade Japan…many Japanses might have died…thousands of Allied lives would have been lost too. Yes, but unlike with the atomic bombings, very few of the casualties would have been innocent civilians (women, children, elderly) in that case. >Japan has never apologised for those atrocities. Japan has made official apologies for it’s actions during WWII on more than one occasion. when i saw the photographs on 23rd.july,2013, i could not but shed tears. i was born on 1947, 6th september. i felt that my soul became one with the boy. 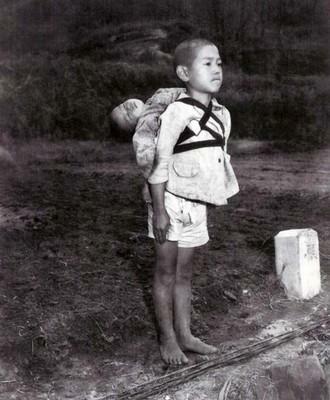 i felt the same pain as the nagasaki boy must have felt when he lost his younger brother. i am now forever a changed man. i will carry this loss in my bosom as mine till i live.. It is a sad photo. I honestly can’t believe North Korea is testing nuclear weapons after all this. Haven’t they learned from the mistakes of others? Launching missiles, on any country (not just the U.S.), would kill many people and damage the ecosystem. The radiation would affect survivors for probably the rest of their lives. That would be a cruel fate for any person or living being, to die by some sort of nuclear explosion. The North bombing parts of any country would produce the same results as Nagasaki and Hiroshima. Women, children, and men would be killed, with no way to really defend themselves. Survivors of all ages would be traumatized, thoughts poisoned with their loved ones’ deaths. In your post, you have a quote from Joe O’Donnell. “…I want to express to you tonight my sorrow and regret for the pain and suffering caused by the cruel and unnecessary atomic bombings of your cities…No more Hiroshimas! No more Pearl Harbors! No more Nagasakis!” This pain is all unnecessary, as he says. Unfortunately, that country isn’t the only one that continues to build and test nuclear weapons. Some world leaders mistakenly believe that power is the ultimate goal, it seems. Well, I beg to differ. If Japan had a deliverable nuclear weapon and America had knowledge of it, would they have still attacked? Just a thought. Sometimes, being able to only project enough of a fear in the opponent of a matching or devastating response may keep the enemy from mounting a mass-destruction attack just for its own sake. I feel it’s more like the security signs or a barking dog in a house which deters burglars more than if you always leave the front door open and keep the lights out, inviting trouble. Having some form of defense actually prevents such loss and devastation. At the same time, I condone any actual USE of such weapons. First we should try to eliminate it from all countries even the superpowers, no one country should have a holier than thou attitude that we could possess them because if we judge past record, the US should be the first to disarm since they are the only ones who have used these weapons against another nation. Otherwise stop telling others to abstain from possessing such weapons because that is just hypocrisy and you don’t have any moral authority to tell others not to and if you force someone to disarm or prevent that gives them all the more reason to pursue such weapons – to stop such intimidation. >If Japan had a deliverable nuclear weapon and America had knowledge of it, would they have still attacked? If both countries had nuclear arms, then neither probably would have attacked the other … but if the situation were simply reversed from actual history, and Japan had the bomb but America didn’t, Japan may very well would have dropped it on America. Yes, it happened post-WWII between America and Russia. The “mutually assured destruction” of the Cold-War. >I (don’t) condone any actual USE of such weapons. Hopefully everyone feels that way! As you mentioned above, “mutually assured destruction” is possibly the only thing stopping some countries from using their own nuclear weapons. Thanks for quick reply and more thanks for fixing condone to don’t condone for me. lol I screwed it completely. I absolutely don’t condone their use and in an ideal world, they’ll never be made or used. Is there a link to my blog on facebook? Thanks, I didn’t know about it. I wouldn’t say that “America does whatever it wants”… I think that America does what it thinks is best. In hindsight, some of those decisions may have been wrong … but that’s only natural — it’s important to learn from mistakes though. Umm actually, even though japan started it, we didn’t have to be THAT harsh. I’m an American, but looking at the stuff we did,… It honestly shames me to be one. I mean come on… The lead creator of the manhattan project (the person who made the bombs) apologized for the utter devistation it caused on the Japanese. It’s not something to be proud of at all. I don’t think there’s any reason to feel ashamed of being American. Most Japanese people hold no hard feelings toward America anymore…everyone knows that war is terrible (and terrible things were done by both sides). World War II is history. The mistakes should be learned from and not repeated…but almost no one holds a “grudge” or anything. Besides, America and Japan have helped each other a lot in the years since. Ours countries’ relationship is strong. It’s now a year after I wrote this post…2011 August 9. Today is the 66th anniversary of the bombing of Nagasaki (and the fourth anniversary of Mr. Joe O’Donnell’s death). The U.S. Ambassador to Japan did not attend the peace ceremony in Nagasaki yesterday as he did in Hiroshima last Friday. Japan started the war! How can you apologize?? And Hiroshima and Nagisaki saved 1000’s and 1000’s of American lives! “Japan started the war so we had to strike back with nukes”… This childish way of thinking is the reason why wars start in the first place. And with my humble English I don’t even see the quote as an apology in the first place. It’s merely an anti-war statement… But whatever, I don’t know all the context. On a side note, have you watched the mini-series “The Pacific”, produced by Tom Hanks and Steven Spielberg, Tokyo5? It thematizes the battles of Guadalcanal, Peleliu, Okinawa and Iwojima from a more or less anti-war point of view. Really a masterpiece in my oppinion, though I liked their first WW2 mini-series “Band of Brothers” even more. >have you watched the mini-series “The Pacific”, produced by Tom Hanks and Steven Spielberg, Tokyo5? I’ve heard about it but haven’t watched it. I’ll try to watch it then. >I liked their first WW2 mini-series “Band of Brothers” even more. I haven’t even heard of that one. “Band of Brothers” follows some American soldiers through WW2, just like “The Pacific”. The difference is that it follows the battles in Europe, starting with D-Day and ending with the end of WW2. This is the better of the two series? I didn’t apologize, actually. It was Mr. O’Donnell who did. And he said that what Japan did in WW2 was wrong (including the attack on Pearl Harbor), but the U.S. response of dropping two atomic bombs was too much and unnecessary. >Hiroshima and Nagisaki saved 1000′s and 1000′s of American lives! Some people say that’s not accurate because Japan was about to surrender anyways. But even if it is, those lives would have been soldiers. The bombings killed many civilians…including women and children. I agree, I think the US overreacted way too much, but we are both guilty, and war is not a pretty thing, that is why I hope I do not live to see a WWIII, or any war on American soil, but I also don’t like war on any soil at all because civialians will always be put at risk, and Black sabbath hit the nail with the song War Pigs, why don’t the politicans go to war? Yeah, it’s easy for politicians to send people to fight a war…while they’re safe at home. What really started the war was when the American black ships showed up in Uraga Bay and started firing their cannons in 1853 to force Japan to open her borders to trade. That didn’t start any war … rather, that started Japan’s modernization.